Classical Revolution breaks preconceived notions about classical music by presenting in a casual atmosphere. It humanizes that aura of perfection sometimes presented in a concert hall. On a cold November night, I make the trip down Hamilton Ave. to Northside Tavern, a community bar established in 2002. Surrounded by dim light, wooden doors, brick walls, old floors, ceiling fans and a historical bar, Classical Revolution presents a concert series on the second Sunday of every month at 8:00 p.m. Organized by Laura Sabo, 40, a musician in her own right, Classical Revolution originally began in 2006 in San Francisco founded by Charith Premawardhana, an Ohio State University graduate. A violist named Vince Scacchetti founded the Cincinnati branch of Classical Revolution. When he stepped down, he suggested Sabo fill the role. After some thought and encouragement from a colleague, she agreed. Classical Revolution is a labor of love. It is an all-volunteer group of accomplished musicians, including Cincinnati Symphony Orchestra players, faculty and graduate students from the University of Cincinnati College-Conservatory of Music, faculty from Xavier University and The College of Mt. St. Joseph and Dayton Philharmonic performers, among others. While Sabo receives a nominal amount of compensation, most of the work is done for free. 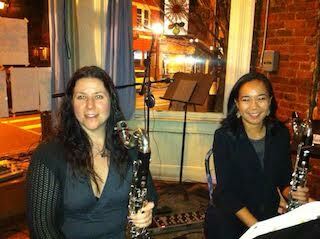 Sometimes, guest CSO conductors and musicians stop by to play at the gig. While the intention of the group is to bring classical music out of the concert hall, Classical Revolution’s scope is larger than that. On Sunday, November 9, for instance, there was a program of bass clarinet duos, performed by Sabo and CCM doctoral candidate Stephanie Akou; the Ohio Brass Quintet with new members; a piece entitled “Chapter One, Page One” by Ian Dicke (2008) celebrating Henry Miller’s Tropic of Cancer, performed by saxophonist Ryan Van Scoyk (preparing for a solo tour in Colorado); and a recital of tabla, an Indian drum, by Jim Feist, teacher and performer of the instrument for 18 years. Sunday night, fourteen musicians turned out to perform. Gradually, Northside Tavern is filled with people of all ages sitting at the bar or at the tables along the side of the Tavern. Attendees listened intently, politely and clapped after each act. Some of the people were in their 40’s, 50’s and 60s; others in their 20’s gathered in the back of the tavern. Young attendees Tim Burns, 26, of Northside and his friend Kierston Brickweg, 29, Walnut Hills, have come most months. Burns found the music very approachable, as opposed to a formal concert hall. Special events will be a performance of early music in February 2015, as well as a concert series during the Constella Festival in April 2015.